Sink Base workstations can combine with several designs of of upper storage units to create a hutch-like, super-efficient unfitted breakfront. The ST storage units in the middle section provide an extra countertop in the reach zone as well. Shown above is a TP84B-AD above a ST84 above a S84A-INT base unit, all combining into one beautiful breakfront. This Hampton’s Mahogany breakfront features our Craftsman-like Grid door styling. Starting at the bottom, the S84A-INT base unit features a Copper Swirl granite top, a black porcelain apron front under-mounted sink, and a Bosch integrated dishwasher with a tray storage door to its right. The controls of the integrated dishwasher are completely concealed inside the top of the dishwasher and our wood grid door attaches directly to the door of the dishwasher. Fisher & Paykel Dish Drawer dishwashers operate in a similar fashion when integrated with one of our sink bases. Both dishwashers are much more expensive than our flipper door system that conceals less expensive standard dishwashers. Next, an ST84U Storage unit conceals small appliances behind ribbed glass sliding doors, and its Natural Cherry counter-top provide great space for dish storage. The top is also within easy reach so it functions as an excellent food-prep or clean-up surface. A halogen light located above the sink can provide point-of-use illumination for the sink area. Next, a TP84-A-AD unit provides space for the everyday dishes. 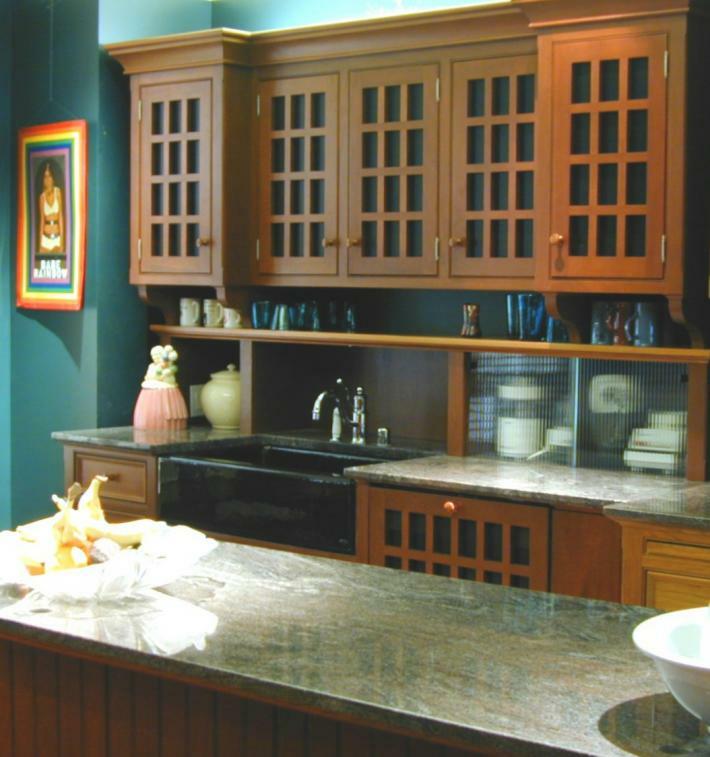 The end cabinets are 18″ deep and the three center doors conceal 11″ deep compartments. This breakfront has a total height of 88″. Our (tall) TP units are another option for this series which would bring the total height of a breakfront to 95 ½” above the finished floor. Shown above is a TP76B-Tall over a ST76 over a S76U base unit. This breakfront is 96″high. Made of Natural Cherry this breakfront is similar to the one above, but features open shelving instead of three doors in the middle of the TP unit. 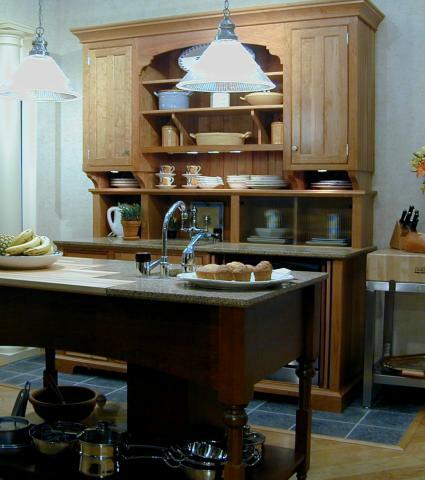 This piece was displayed in a 2001 K/BIS exhibit that featured 14 YesterTec pieces in a formal living/dining room. 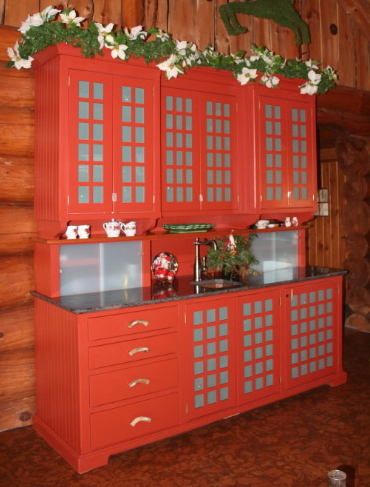 This three piece breakfront functions as an auxiliary food prep/wet bar hutch in its log home. Its bead board sides reflect the country look of the kitchen (decorated for Christmas) and the green color of the perforated aluminum grid panels match the color of the room’s center island workstation.